What is wellbeing, anyway? To start, it isn’t simply about being happy, or wealthy or successful. It’s not just about physical health and wellness and it’s definitely not about just eating right and getting enough exercise. In fact, if we focus on any of these items alone, we will end up neglecting our overall wellbeing. Wellbeing is a combination of activities, actions and states of being that we embrace on a daily basis. It is having a balanced perspective about our studies, making sure that we are caring for our bodies with exercise and nutrition and taking pride in the way we treat our friends and loved ones. It is about nourishing our physical, emotional and spiritual needs. 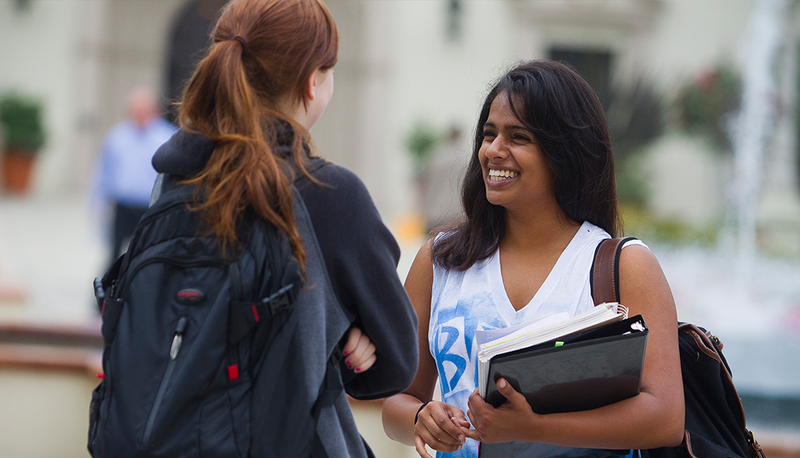 The University of San Diego is committed to your wellbeing. Whether you want more information on sleep resources, exercise or nutrition, spirituality or community and connection, we can help. Take a look at some of the resource guides we have available below. If you don’t find what you are looking for, please let us know, so we can help you find it! If you have a friend who seems to be struggling with an issue that may be more serious than they can handle, there is a lot that you can do to support them. Check out these resources if you have someone you are concerned about. The practice of mindfulness, or the practice of becoming present in your body, has been shown to significantly reduce stress and may even help relieve symptoms of anxiety and depression even in very short intervals (5-10 minutes a day!). Check out our guided meditations for a great place to start if you are interested in exploring how a focused attention to becoming present may benefit you. Did you know that developing systems of organization and time management can greatly reduce your stress levels and increase your productivity? Learn more about managing your time effectively. It is common for individuals to experience distressing reactions like feeling anxious or afraid. It’s also common to think about the event often, even if you were not directly involved. No reactions are wrong or right. Understand how most responses are just normal ways of reacting to the situation.